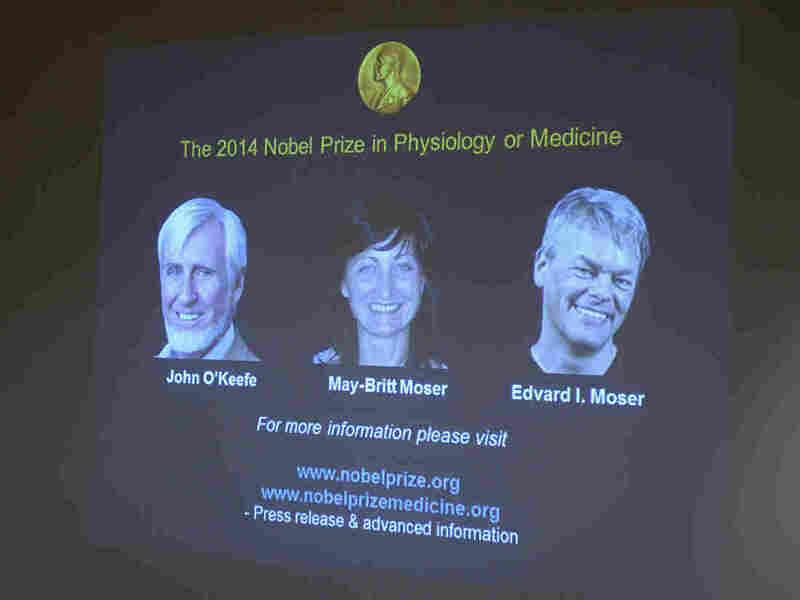 3 Win Nobel Prize In Medicine For Discovering Brain's 'Inner GPS' : The Two-Way The scientists, one working in Britain and a husband-and-wife team from Norway, will share the award for work that began in the 1970s and spanned decades. 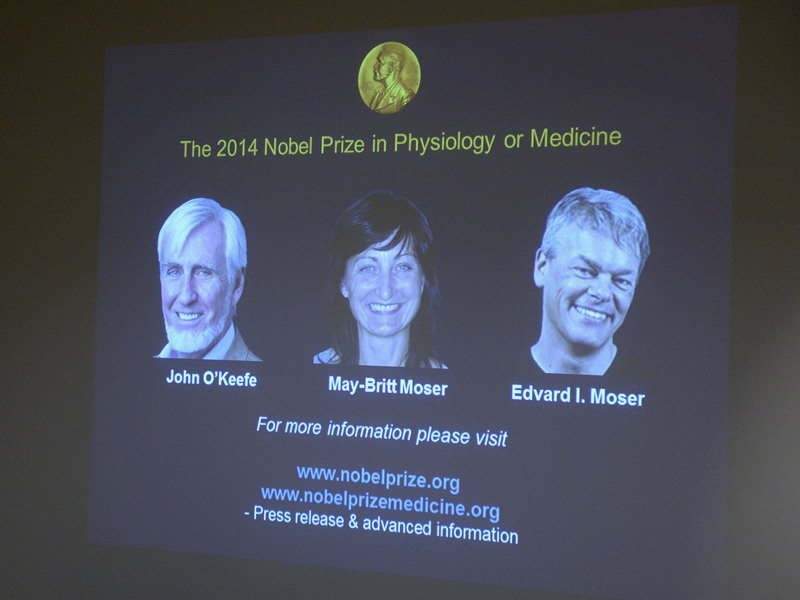 A screen presents the winners of the Nobel Prize in Medicine, U.S.-British scientist John O'Keefe and Norwegian husband and wife Edvard Moser and May-Britt Moser, for their discoveries of cells that constitute a positioning system in the brain. Three neuroscientists from Europe will share the Nobel Prize in Physiology or Medicine for their discoveries of how the brain determines where the body is in space. John O'Keefe, a professor of cognitive neuroscience at University College London, will get half of the prize — 8 million Swedish kronor ($1.1 million) — and May-Britt Moser and her husband, Edvard Moser, of the Norwegian University of Science and Technology in Trondheim, will split the remainder. "In 1971, John O'Keefe discovered the first component of this positioning system. He found that a type of nerve cell in an area of the brain called the hippocampus that was always activated when a rat was at a certain place in a room. Other nerve cells were activated when the rat was at other places. O'Keefe concluded that these 'place cells' formed a map of the room. "More than three decades later, in 2005, May-Britt and Edvard Moser discovered another key component of the brain's positioning system. They identified another type of nerve cell, which they called 'grid cells', that generate a coordinate system and allow for precise positioning and pathfinding. Their subsequent research showed how place and grid cells make it possible to determine position and to navigate." Neuroscientists May-Britt and Edvard Moser explain their research. "This is something that philosophers and brain scientists had speculated about for hundreds of years," NPR's Rob Stein says. "The committee said the discovery of the brain's GPS system really represented a paradigm shift in how specialized cells in the brain work together to create complicated thinking abilities," Rob says. "It really opened up whole new areas in how our brains work in creating things like memory and planning." The Associated Press says: "This 'inner GPS' helps explain how the brain creates 'a map of the space surrounding us and how we can navigate our way through a complex environment,' the Nobel Assembly said." The Nobel awards in physics, chemistry, literature and peace will be announced later this week. The economics prize will be announced next Monday, according to the AP.